My computer was down and then died unceremoniously, and so I was unable to blog for quite a while. I think that gave me more time than ever to quilt. 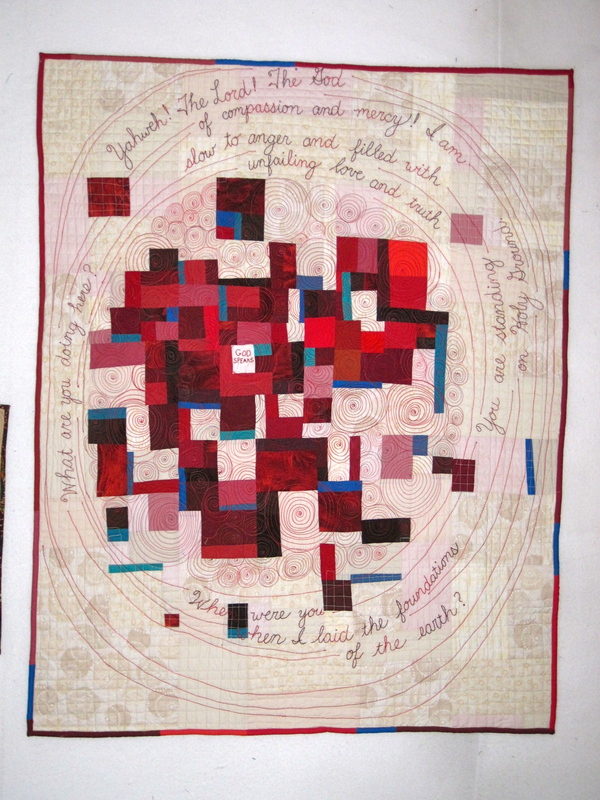 So I am just going to post a few pictures of finished quilts and continue on from here. 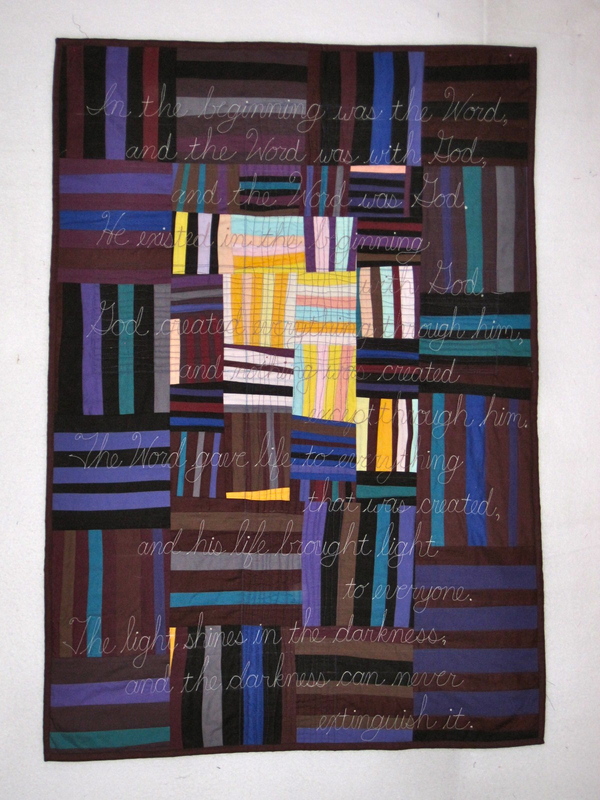 Here is the finished “God Speaks” quilt. I really like how this one came out. I like the message,the clarity, and the design. I am surprised that I like it so much. “And the Angels Sang” finished. After I washed it the white lettering was more visible. I was toying with the idea of adding buttons and beads to this quilt. But I finally decided that the embroidery and lettering is too subtle, and that all the sparkly stuff would actually detract from the detail work. I’ll save those buttons for a later quilt! This is the latest finished project. I have thought about this design in one way or another for quite a few years. I sit in church and look at the big cross on the wall in the front and read the first few verses of John 1, which are quite beautiful. I finally decided to do it in the simple housetop style, trying to get the effect of the “light shining in the darkness.” It is very subtle (too subtle probably,) but there is a cross quilted into the background with the words superimposed on top of it. I might have to do this one again. Oh, and I just realized, this is not the finished quilt. 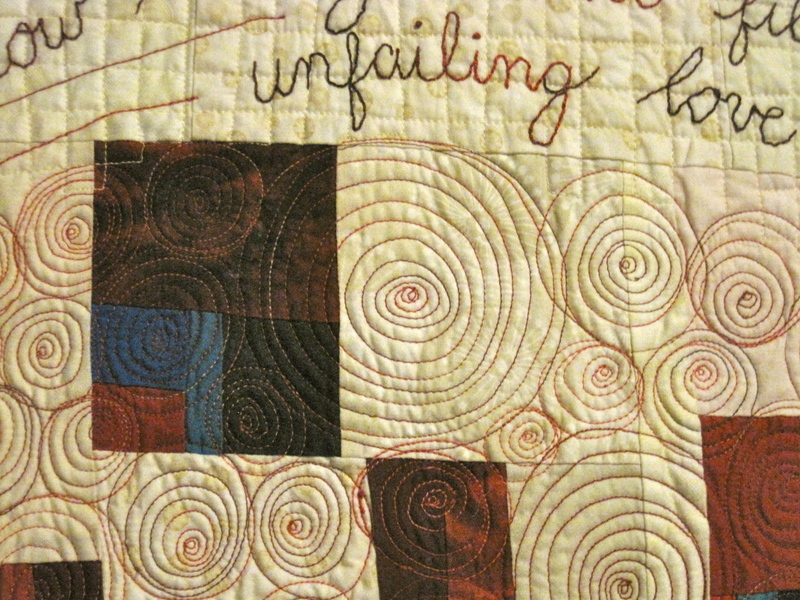 I quilted wandering vines in the parts that don’t have any quilting. I’ll post another picture of that tomorrow. And my newest project is a bit of a departure. 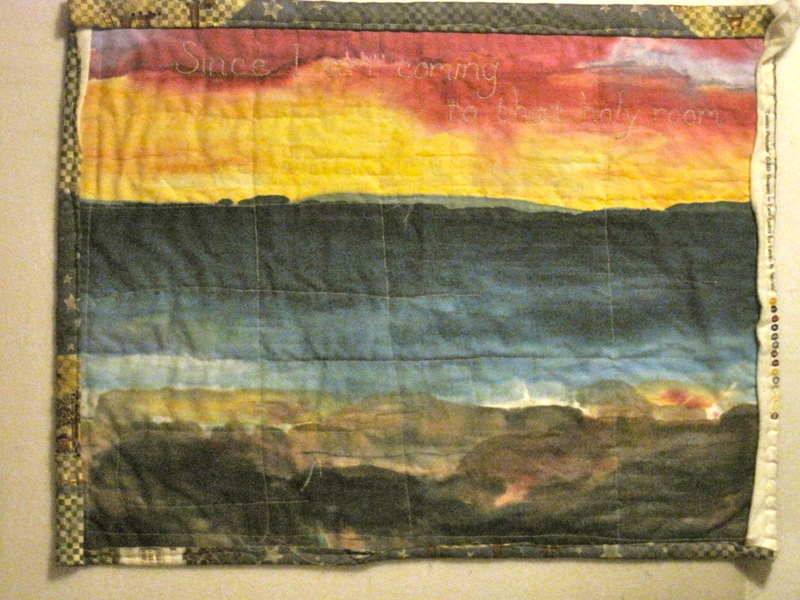 Instead of using the solids, I am using a piece of hand-dyed fabric that I have saved for years. It was dyed by Mickey Lawler of SkyDyes fame. And instead of using scripture for the wording, I am using a wonderful verse from Jon Donne. I have saved the bit of paper with this verse printed on it for 10 years! Just waiting for the right project. I saw someone use chain stitching on a project in the latest Quilting Arts magazine and thought it was quite effective. So am using that on this project. It goes quite slowly, but is very pretty, I think. 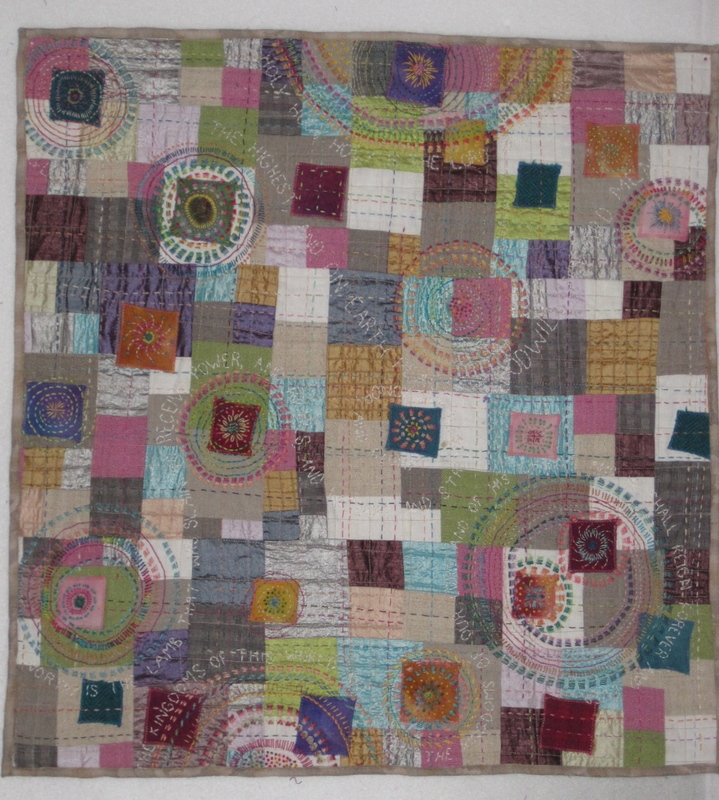 I am planning to do a lot of kantha-type embroidery on this quilt. And that’s what’s been going on around here. Along with the computer and plumbing problems, and various and sundry things of everyday life, that is! 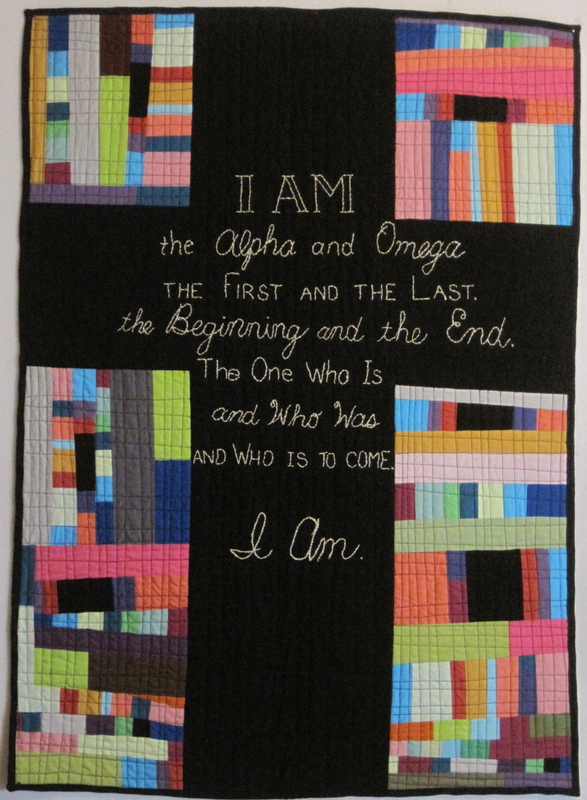 I took a little detour from the “God Speaks” quilt to finish up another quilt. 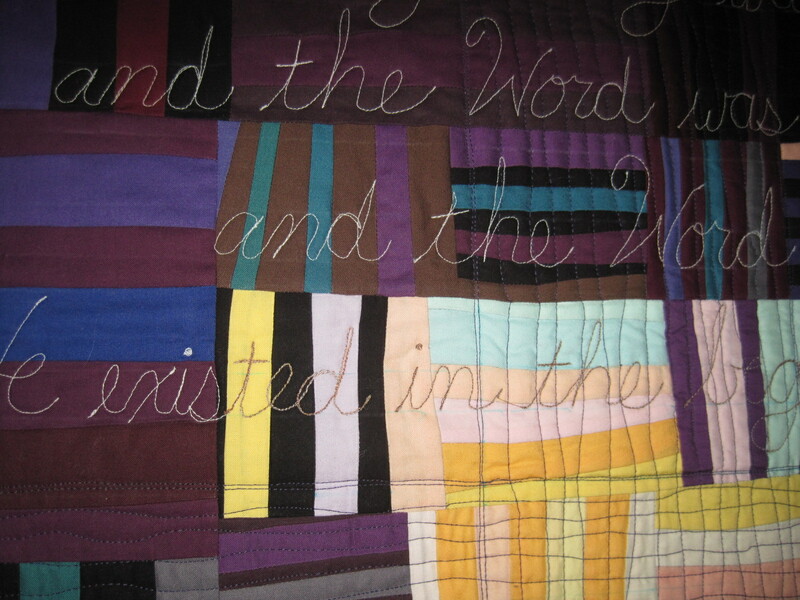 I needed to think a bit about how I was going to put the words around the central image in the quilt. 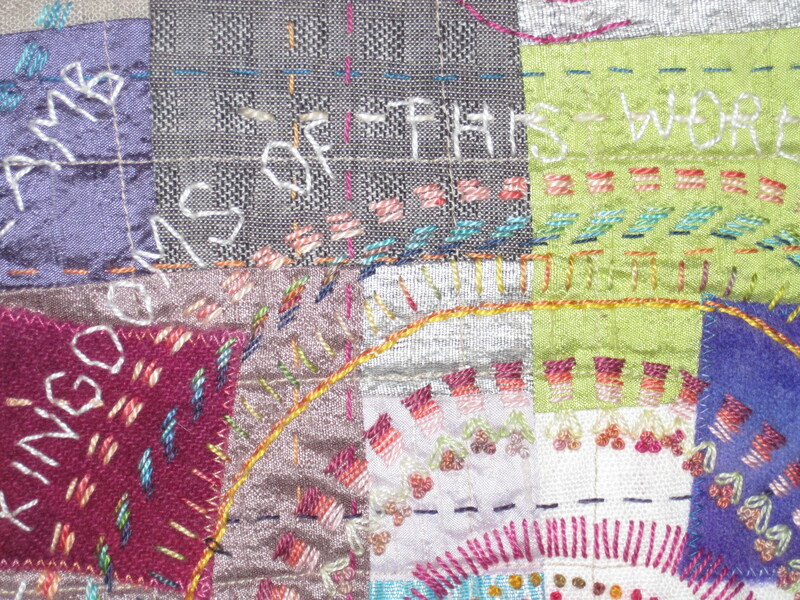 Sometimes it helps to let the quilt just hang on the design wall and think about it. Here is the quilt that I finished up while letting the other one rest. 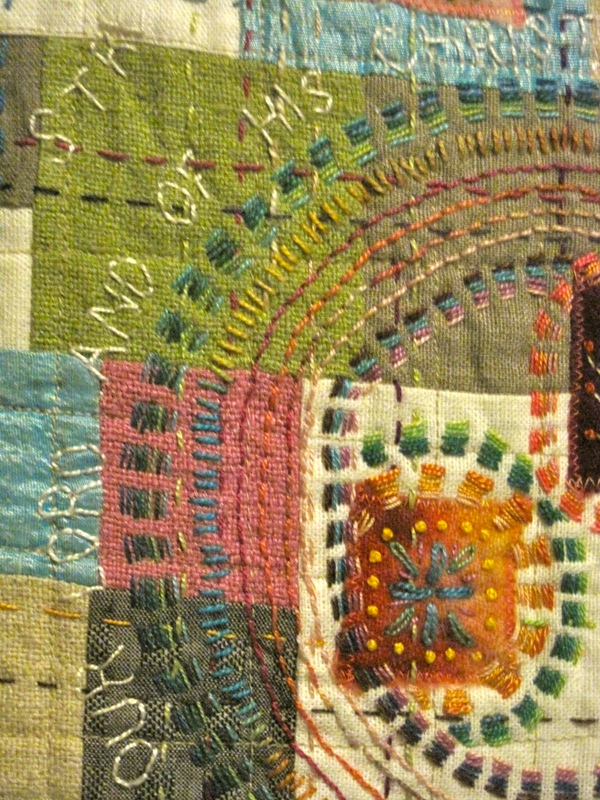 This one was almost finished, and the words were all planned out, so it was just a matter of getting them stitched in place (no thinking or creating needed at this point.) I do love this quilt. I made myself a rule that I can have no more than 2 unfinished housetop quilts going before I can start a new one. This is a good rule for me, as I often have a new! exciting! idea!, and finishing a quilt can be a bit boring. This way I continue to make progress on my goal of twenty finished housetop quilts by October 1. 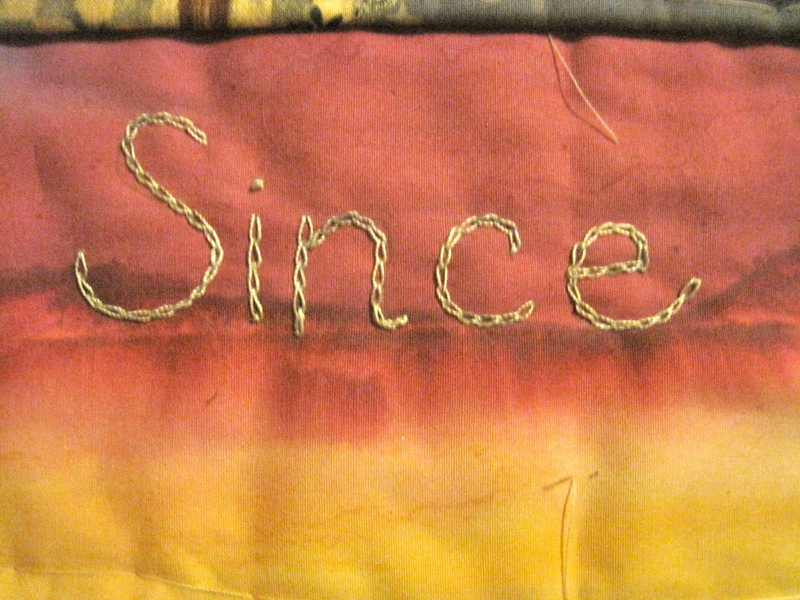 Wow, that’s coming up quickly–I’d better get stitching!